Nissan Silvia S15 - J's Garage Export Co., Ltd.
1999. 1 : NISSAN announced the release of the 7th generation of Silvia, the S15. The S15 Silvia spec R is a rear-wheel-drive sports coupe, powered by Nissan's SR20DET; a 2.0 liter in-line 4 cylinder turbocharged engine with air-to-air intercooler that delivers a power output of 250 horsepower that results in a power-to-weight ration of less than 5Kg/PS. The S15 has a new 6-speed close-ratio gearbox for improved acceleration and features a specially tuned exhaust system characterized by a powerful sound at low engine speeds and a liner increase at high engine speeds. The Silvia Spec R is fitted with a newly developed 6 speed manual transmission. Steering system stiffness has been increased to provide improved steering feel. The front strut suspension and rear multi-link suspension has been carried over to the S15 Silvia. Strengthening the upper member of the hood structure and adding reinforcements to rear pillars has increased body stiffness. The S15 Silvia Spec-S is powered by the SR20DE 2.0-liter in-line-4 DOHC engine, which produces 165 horsepower and 19.6kg-m of torque (Manual Transmission). 2000. 7 : AUTECH announced that it releases the Silvia Convertible Varietta. 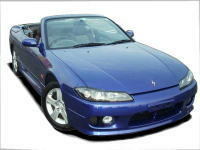 The Silvia Convertible Varietta comes with the first fully opening power metal top to be featured on a domestic convertible. The top raises and lowers in about 20 seconds, driven by an electric motor that is operated by an instrument panel switch. The Silvia Convertible Varietta adopts 2+2 interior packaging with comfortable seating for 4 passengers. 2000.10 : The L-package and the Type-B are added to the Silvia line-up. The L-package includes exclusive interior features (under instrument panel, vent grille, silver meter, inside door handle, shift finisher, and aluminum pedals) for silver/silver color scheme and black/silver leather seats to create a sporty interior ambience. It also comes with remote control entry system and fog lamps. The Type-B is a custom base model. 2002. 1 : The V-package is introduced. The V-package models are based on the Spec-R/Spec-S featuring exclusive front seats, 1DIN type MD/CD player, privacy glass, and High Intensity (H.I.D.) Xenon headlights.